Sitting below the Tucson and Santa Fe, the Kona is the latest addition to the Hyundai range. Its chunky design is surprisingly attractive, especially when you combine it with one of the available two-tone colour options. Inside the interior isn’t as edgy as the exterior but it’s bright, modern and comfortable. It is not the largest but there is a decent 361 litres of space in the boot or a roomy 1,143 litres of space with the rear seats folded. There are three trim levels; Comfort, Executive and Premium versions and standard equipment is good including lane keep assist, 5ins chrome screen, air con, cruise control, 16ins alloys, roof rails and LED running lights. The Executive trim gains Android Auto/Apple Car Play while driving aids such as front park assist and blind spot detection are standard on the top of the range Premium. Engine options include two turbocharged three-cylinder petrol engines – a 1.0 120bhp and a 1.6 177bhp. There is one diesel option a 1.6 111bhp. An all-electric Kona with a range of 482kms will join the range in January 2019. On the road, it is comfortable and capable and takes motorway driving in its stride. The Kona really turns up the heat in the crossover segment, it may not be the most spacious crossover but it offers a compelling blend of style and value with day-to-day practicality. Kia has blessed it’s Stonic with the necessary SUV visual cues and it is instantly recognisable thanks to key signature design elements such as the ‘tiger-nose’ grille. 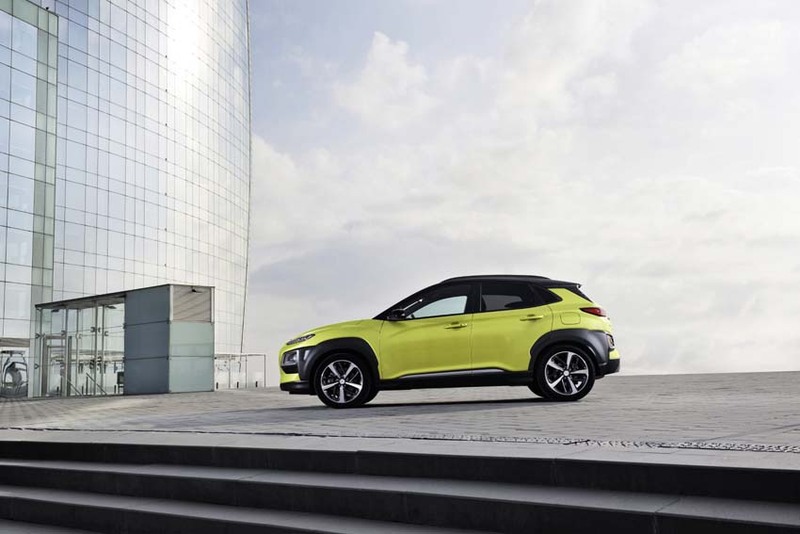 The Stonic is billed as the “most customisable Kia ever” an important selling point in this market – with a choice of nine body colours and five complementary roof colours, allowing for a total of more than 20 combinations. Sitting beneath the Niro, Sportage and Sorento in the range, this smart crossover sports black plastic cladding, roof bars and a raised ride height. Inside, the cabin is bright. There’s a good selection of engines, starting with a 1-litre petrol, a 1.25 and a 1.4-litre petrol along with one 1.6 diesel engine. Trim options go from K1 to K4 each gaining more goodies. On the road, the Stonic is full of character with reassuring handling and a well-cushioned ride. Overall it is the ideal car for people who want chunky good looks, reliability and space without taking up half the road. If imitation is the sincerest form of flattery, then Nissan should be positively glowing with pride. They may not have reinvented the wheel in 2007 when they launched the Qashqai but with over three million sales worldwide since launch, they certainly came close and it spawned a whole raft of imitators. But with more rival manufacturers scrambling to get in on the act, Nissan revamped their clever crossover last year and it is now cleaner, greener with overall quality improved. Inside, the cabin is plush and modern and space is good all round, with decent legroom for passengers, both front and rear. 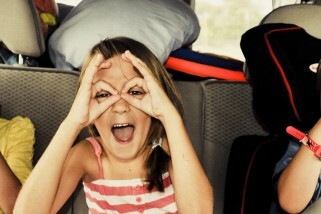 There is also more than enough room for five adults and the boot can swallow 430 litres. Buyers can choose between FWD and 4WD and a variety of engine types to suit a range of driving styles. Equipment levels are generous across the range. The Qashqai is still a strong contender in a segment it created but it isn’t all good news as it doesn’t quite match some rivals for driving dynamics and is lacking some of the kerb appeal of others but it still a good all-rounder that’s a hassle-free family car. The Juke’s quirky design is still as eye-catching as when it first launched but design alone is not enough to tempt buyers. Inside, its advancing years are beginning to be very evident. Space-wise, two adults can fit in the back, but a third will need to be on good terms with the others as it is quite tight for space. Despite the SUV pretensions, the Juke is a little larger than a Ford Fiesta. On the road, it’s good to drive thanks to perky engines, taut handling and stiff suspension, though it may be a little too firm for some tastes. Buyers can choose from a 1.2 and 1.6 petrol or a 1.5 diesel and four trim levels: XE, SV, SV Premium and SVE, and the features increase accordingly with each level. The Juke fares well for safety systems and was awarded five stars when Euro NCAP tested it in 2011. When revamped in 2014, safety was also enhanced. though it is worth remembering that the safety test has become harder with each passing year so it’s unlikely the Juke would fare quite as well today. While it is beginning to look its age, the Juke is fun to drive, either around the city or holding its own in the jet stream of the middle lane. Quirky and affordable, it is still the one to opt for if you want to stand out from the crowd. Opel’s new Crossland X is a stylish new arrival. 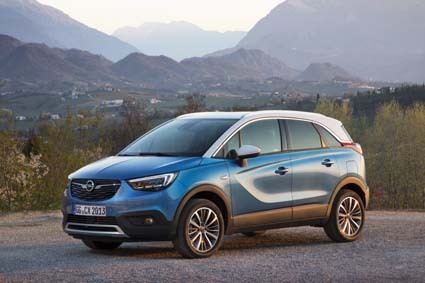 As with the other cars in the Opel range, the X denotes an SUV, the Crossland is the smallest. While it is only just 63 mm shorter than the Mokka, these small figures do make a tangible difference and the Crossland is designed to be a more urban alternative. Compared to rivals, the interior is a little drab but it is practical and easy to use. Opel’s OnStar functionality gives you your own personal onboard assistant while the Wi-Fi hotspot will be a welcome addition for families, especially on long journeys. On the road, it’s a perfect urban runaround as it is light and easy to drive but at motorway speeds, the refinement could be better and it’s a little too harsh on anything with less than perfect road surfaces. Buyers can choose from a three-cylinder 1.2-litre petrol engine or a 1.5 diesel. Depending on the engine, there’s a choice of five or six-speed manual gearboxes or a six-speed automatic and two trim lines SC and SE. The Crossland falls short on ride quality and driving dynamics but smart styling, good technology and comfortable handling making it a good choice at a family car. Design-wise, the 2008 is not the most imaginative on the market but it is higher, longer and wider than its hatchback sibling, the 208. Engine options include a 1.2 petrol and two 1.6 diesel units and all come with good economy and low emissions. Three versions of the 2008 are offered – Active, Allure and GT line- and while the 2008 does not have four-wheel-drive, it does come with an optional grip-control system to provide maximum grip on slippery or muddy conditions so it is a very credible alternative to traditional 4WD systems. Plus, there is no extra weight added with the grip control system and therefore no excessive fuel consumption, unlike a traditional 4×4. Inside Peugeot’s small-steering-wheel won’t appeal to all drivers but there is decent room front and back and generous headroom. The boot has 410 litres of space with the seats in place and 1,400 litres when the rear seats are folded. On the road, it’s nippy, agile, without being exciting, you wouldn’t want to throw it into corners but then you don’t buy a crossover to hang out in the fast lane. So, while it’s refined rather than exciting the 2008 is a very likeable family car that will get you where you want to go comfortably, reliably and safely. The Renault Captur created quite a stir in the booming crossover market when it hit the roads in 2014. Updated last year, the French company’s smallest crossover continues to turn heads with stylish good looks. 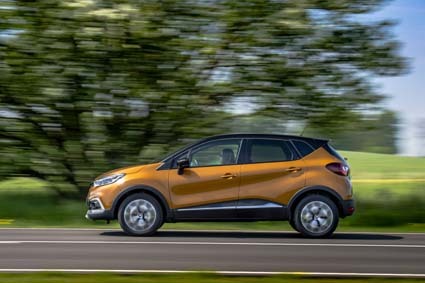 The Captur continues to be powered by the same set of petrol and diesel engines but gains two new ones, a 1.2 petrol and a 1.5 diesel. Five-speed manual gearboxes are offered on the smaller engines and six speeds on the larger. Whichever you choose, fuel economy is good with particularly impressive figures from the 1.5 dCi that returns a claimed 3.7 litres per 100km. Inside, the Captur is deceptively spacious and there are some nice details and clever touches. If a family car is measured on how much stuff it can hold, then the Captur’s boot space of 455 litres; or up to 1,235 litres with the rear seats folded, doesn’t disappoint. On the road, it’s nice to drive, nothing blistering, but it’s agile, predictable and refined. Ferrying the kids around is no problem and features like the zip-off seat covers that can be removed and washed and the sliding rear seat will only add to the appeal of this car for families on the go. 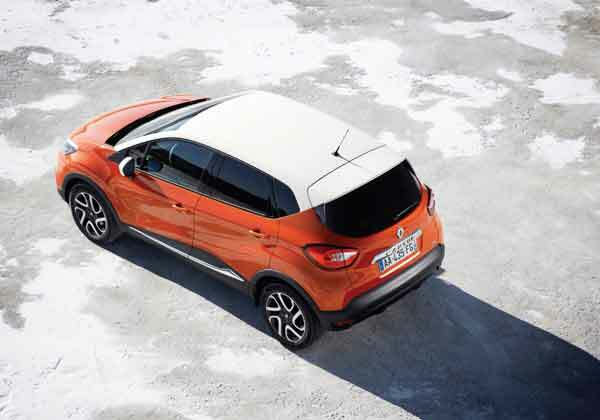 The Captur is still an appealing family car, you get a bargain and a fashion statement all in one. The Renault Kadjar has a proved a popular alternative for those seeking a little more space than the Captur. Inside, the cabin is spacious and Kadjar drivers will enjoy the high driving position and stylish, well laid-out interior. The boot can hold 527 litres and if you’re carrying something especially large, you can always fold the back seats down. There are three engines available: 1.2 petrol 130bhp, 1.5 diesel 110bhp and 1.6 diesel 130bhp. The Kadjar is available as both two- and four-wheel-drive and in four trim levels: Expression +, Dynamique Nav, Dynamique S Nav and Signature Nav. 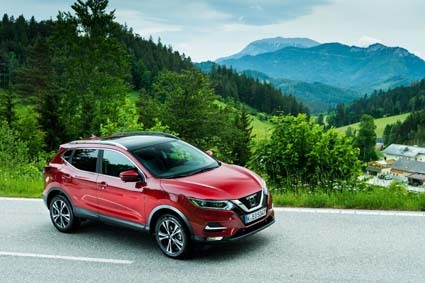 Based on Nissan’s Qashqai, Renault’s version is more spacious and comes with a larger boot so it’s ideal for someone who loves the practicality of a family sized crossover combined with French style and panache. The Karoq may be a strange name; it is apparently a combination of the words Kaa’Raq and Ruq meaning car and arrow in the language of Alaska’s indigenous people and replaces the Yeti – a car with economy, efficiency and a no-nonsense can-do attitude. Reassuringly the replacement has all the clever touches and brings the simple approach that has made Skoda such a success. 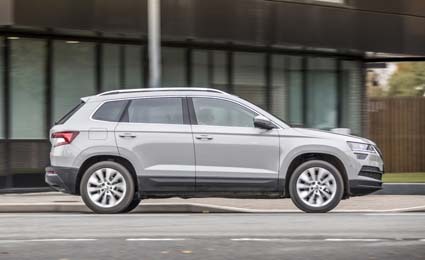 Outside the Karoq looks like a fun size Kodiaq while inside the well thought out cabin is spacious and there is plenty of space front and rear; families will especially appreciate the very generous boot. If you need more space there is an optional Varioflex seating adjustment system to get the maximum space from pushing the rear seats back. Two engines power the range, a 1.0 petrol and a 1.6 diesel and you can choose a six-speed manual or seven-speed dual-clutch automatic gearbox. The Karoq is a great all-round crossover, it offers space and functionality for five people plus it comes with clever and versatile seating. Blazing an impressive trail since it first launched, the funky C-HR will certainly stand out in the supermarket car park with its sleek coupe-shape roofline, bulging wheel arches and sharp creases. Inside it’s surprisingly roomy, even in the back, but headroom is tight for tall passengers and kids may find their vision slightly compromised by the upward-sloping rear windows. The boot offers a reasonable 377 litres of space. The cabin looks great and is really easy to use with everything buyers demand, including an eight-inch touchscreen for sat-nav, reversing camera and a full range of infotainment features. Thanks to its low centre of gravity, the C-HR is good to drive, the ride is firm and the steering accurate while the suspension absorbs bumps nicely and keeps you cosseted from wind and road noise. 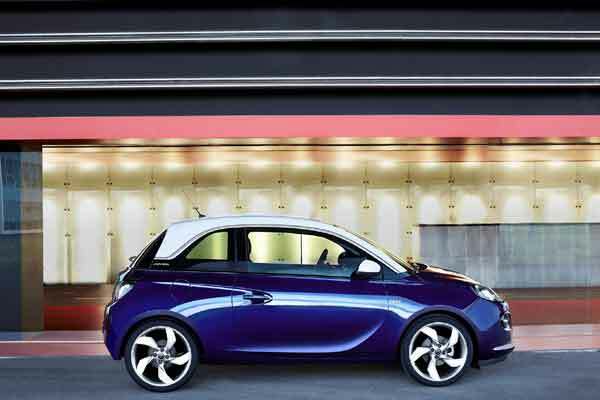 Buyers can choose between a punchy 1.2 petrol or an environment and pocket-friendly 1.8 petrol/electric hybrid. Trim levels are Luna, Luna Sport and Sol and all C-HRs come with a host of goodies including a reversing camera, Safety Sense and adaptive cruise control. Opinion may divide over the styling but the C-HR will appeal to the young and the young at heart, injecting some real fun both into the brand and the compact SUV sector. Aimed at the trendy urbanites who have grown up and started families the T-Roc is a very eye-catching combination of rugged good looks and a sporty profile thanks to the low roofline. There is a choice of petrol and diesel to choose from along with front or four-wheel drive. The interior boasts the sensible styling for which VW is renowned for but the quality is a little disappointing and feels plasticky in places and the boot isn’t teeming with space; at 392 litres it falls short of some rivals. Front wheel drive models of the T-Roc have a larger 445 litres. On the road, it is surprisingly nimble and responsive and will soak up motorways with ease. Various engines are available including a punchy 1.0 petrol engine or a 1.5 petrol and a 1.6 and 2.0 diesel. It’s no easy thing these days for a crossover to stand out from the crowd but despite its silly name and late arrival, the T-Roc is a very impressive car. While it may not be as practical as rivals, in terms of driving dynamics and style it’s head and shoulders above the rest.